The MarketScape wizards at IDC have pounced on the hyperconverged systems market for their latest escapade, putting Nutanix well ahead of Simplivity. 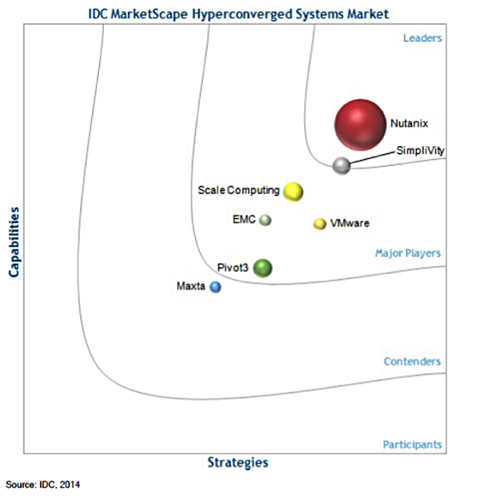 The two are in the leaders' section of the IDC MarketScape: Worldwide Hyperconverged Systems 2014 Vendor Assessment which plots suppliers in a 2D space defined by strategies (low to high) and capabilities (low to high). Only one product is allowed per supplier and there are four areas in the chart with the leaders to the top right, major players next, followed by contenders and then participants. We have seven suppliers, with Scale Computing, EMC, VMware and Pivot3 taking up positions in the major players’ arena, and poor Maxta all alone in the contenders corral. There are no suppliers classed as participants. The size of a supplier’s bubble represents its relative market share. That helps the smaller vendors relatively speaking, and avoids massive bubbles from multi-product vendors obscuring the little guys on the chart. Nutanix and Simplivity supply converged servers, storage and networking systems; complete virtual machine executing systems in a box. However, they also supply software to run on other suppliers’ servers, such as Cisco and its UCS products. That means software-only suppliers such as Maxta, which also uses UCS servers, are included in this MarketScape. That logic gets VMware in as well. We don’t know the products IDC has used from EMC and VMware for this Marketscape; EVO:RAIL would be the natural one from VMware. Is EMC’s product ScaleIO? We don’t know as IDC doesn’t make the report publicly available and suppliers buy rights to publish extracts relating to their product only. There are no products included from Dell, HDS, HP, IBM or Fujitsu or any other supplier. Presumably HP’s 200-HC StoreVirtual appliance came out too late for inclusion. Ditto Gridstore and its HCA product. This market is so fast-developing that reports analysing it risk being out of date when they are published.